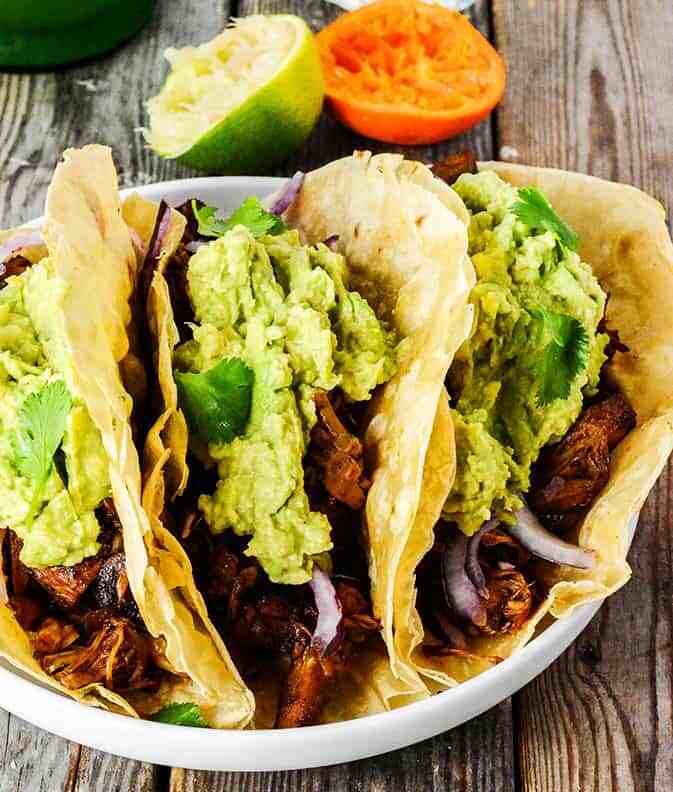 These Jackfruit Carnitas Tacos taste amazing, they will be a hit when you serve them. 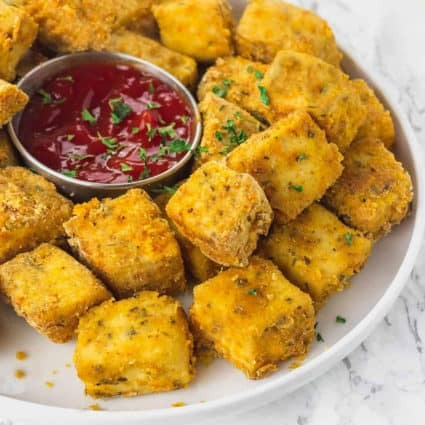 They are full of flavor and they are vegan and gluten-free! 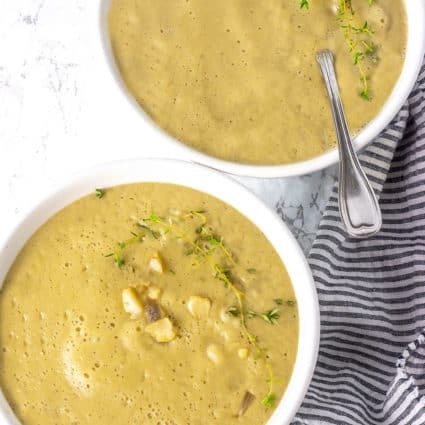 I bought two cans of green jackfruit and I wanted to make a quick and easy recipe because I had less than an hour to leave for an appointment. I decided to make tacos because my family loves tacos whenever I prepare them. I keep a lot of La Tortilla Gluten-Free Wraps on hand so we can always make quick and easy wraps. I also used these gluten-free wraps to prepare my amazing Black Bean Burritos and my Curried Tofu Wraps. Fresh green jackfruit can be purchased from a local Asian or Latino Supermarket, you can find instructions HERE on how to prepare the jackfruit from scratch but I bought the ones in the can. Make sure you get the green jackfruit in brine and not the ripe jackfruit in syrup, the texture and taste are very different. How To Make Jackfruit Carnitas? To prepare these flavorful Jackfruit Carnitas Tacos, I first browned the jackfruit in my non-stick pan (you can skip this step if you don't really care about it looking brown), then I made a sauce using onion, garlic, tomato paste, orange and lime juice, oregano, cumin, paprika, cayenne pepper and liquid smoke for smoky flavor and I used coconut sugar-sweetened and to give a deep caramel color and flavor! The result was amazing, my family loved it and kept asking for more! 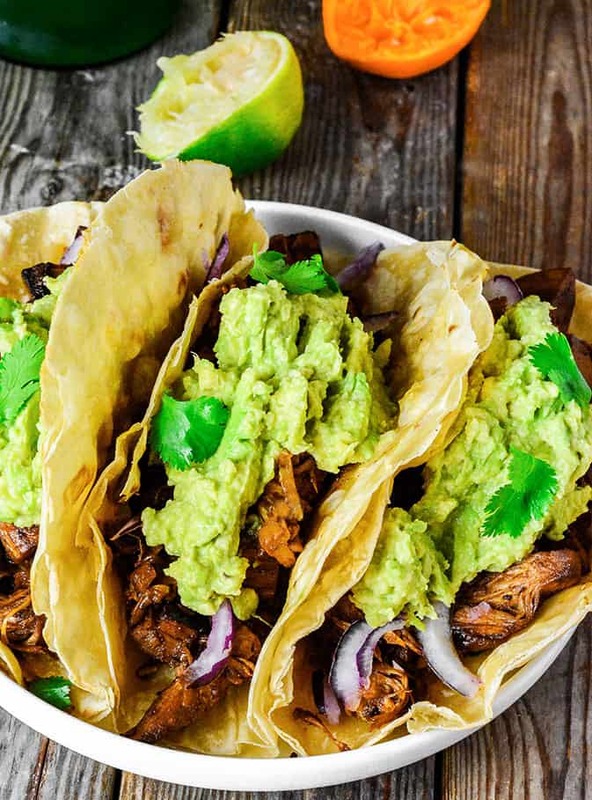 If you make this Jackfruit Carnitas recipe, snap a photo and hashtag #healthiersteps — we love to see your recipes on Instagram, Facebook & Twitter! Heat oil in a non-stick skillet on medium-high, drain jackfruit and pat dry. 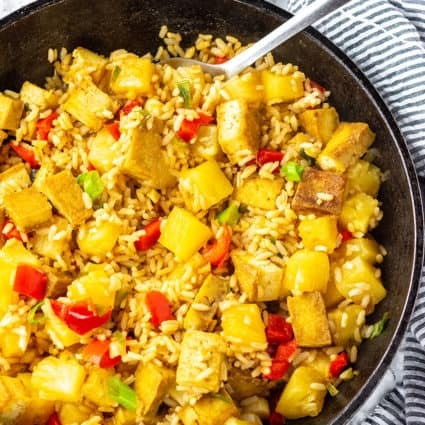 Add jackfruit and cook until brown and crispy on both sides, about 7-10 minutes.Mash with a fork or potato masher, toss with 1 tablespoon Bragg's liquid aminos and set aside while you make the sauce. Add oregano, cumin, paprika and cook until fragrant. 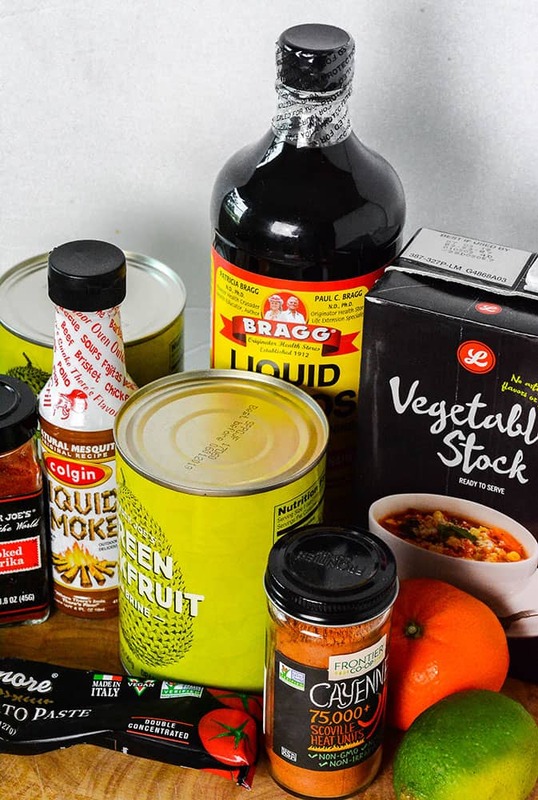 Stir in tomato paste, orange juice, lime juice, vegetable stock, sugar, liquid smoke, cayenne pepper and remaining 1 tablespoon Bragg's liquid aminos and salt. Cook for about 2 minutes for flavors to meld, stir jackfruit in the sauce and continue to cook until sauce evaporates. Just made this and it’s BOMB!! Best jackfruit recipe I’ve made. Followed recipe to the T. Kids and husband approved! The orange juice (I used fresh) was the Star ingredient! So so good! Thank you! Casondra, I’m so happy you and your family loved my recipe. Thank you very much for sharing your feedback. I really appreciate it! It is very versatile, I hope you try it Nicoletta. I haven’t tried jackfruit yet. We can get it at our grocer but it is so terribly expensive. If they ever have it on sale I will definitely try this recipe. It looks awesome! Wow, so sorry it is expensive in your neck of the woods. I really hope it goes on sale soon. I’ve always been so intrigued by jackfruit, especially after seeing it gain in popularity recently. Yes it is amazing how it has become so popular lately, I hope you get to try my recipe. I look at Jackfruit, and I get scared. They are very intimidating looking. I had heard there was canned jackfruit available, but I didn’t realize there were different kinds. With my luck, I would have gotten the ripe on in syrup, and it would’ve ruined the recipe. I love all the spices going into this. They are all my favorites, so I definitely need to give this a try. Aww Patti, the large fresh jackfruits are definitely intimidating but the can is like a piece of cake. Hope you try it soon. I just saw canned jackfruit for the first time – and knew I had seen recipes for it somewhere but didn’t remember… So now I have one, and I can stop and get it next time I’m in the store! Thanks for helping me try something new! Wow, that is such a coincidence Ann. I hope you try it. Michelle, I really love this post! I’ve eyeballed packages of jackfruit at the grocery so many times, but you really inspired me to give it a try! Thanks for the great tips – like exactly which type of jackfruit to buy (so helpful for a jackfruit newbie!) and that you can skip the browning step to save time if you don’t care about the color. Thanks bunches! Thank you Shelley, I hope you try it. I had to do a double take at that first photo. The jackfruit looks very similar to real pork carnitas. 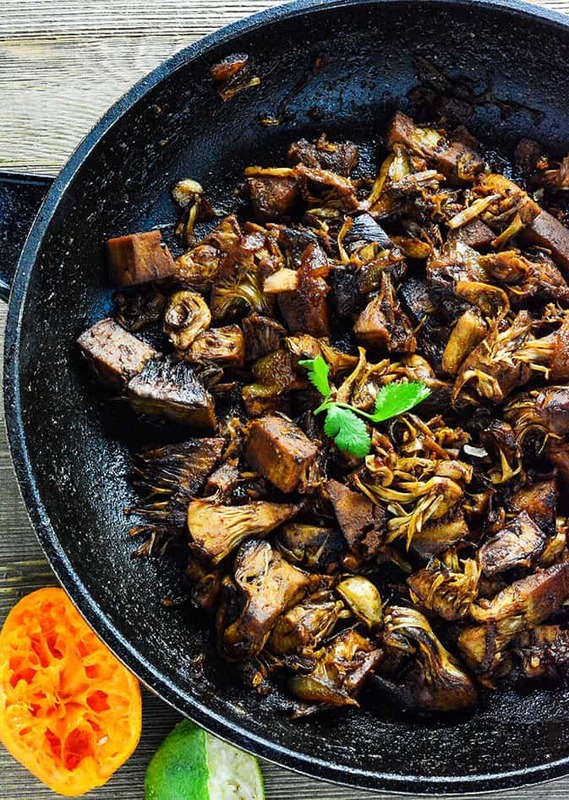 I’ve never actually had jackfruit but the photos and recipe are making me want to try it! Every time I have seen jackfruit tacos or sandwiches in restaurants I will always buy it! Some reason I have never tried cooking it for myself. This needs to happen soon!! These need to be tried! I have heard so many amazing things about jackfruit as a meat substitute and cannot wait to try this vegan version of a Mexican classic! I’m amazed there is no meat in there! Totally serving this up to my vegan friend tomorrow! I was at a loss as to what to make for their family! Thanks! I have never tried jackfruit before. I’m not sure we even have it available here. I love tacos of ALL kinds. These sound very interesting. Rae, I have never had leftovers to freeze but Trader Joe’s food store sells frozen prepared jackfruit so it should work. If you try it please let me know! My mom just made your Jamaican lentil patties and is raving about it!!! I can’t wait to taste it tomorrow and give you my review! By the way, I give the jackfruit carnitas six stars! Excellent!!! I just made this recipe tonight Michelle! I loved it! Thanks for making delicious recipes to share with the world! Blessings to you my friend! That’s wonderful Camille, I’m so happy you loved it! Thank you for your feedback. Recipe looks great. Good information on the type of Jackfuit to purchase (best in brine). Question, the picture appears to show chunks of jackfruit but your instruction says to mash them after browning. So do you just mash some of them or what? Also the info for the tortillas was helpful. Thanks. Thank you Paul, I mashed with a fork but I didn’t mash it until it was very stringy, It’s a personal choice how much you want to mash it. The recipe is very flavorful so the way I did was fine but doing it more will allow more surface area for the seasonings to soak through! Hi Michelle, not knowing anything about jackfruit prompted my question about “mashing” them. Made the recipe today and it was great, very tasty. Now I know a little about jackfruit. Thanks for the recipe and the lesson. Great recipe.